For more than four hundred years, astronomers have used telescopes to study the great variety of stars in our galaxy. Millions of distant suns have been catalogued. There are dwarf stars, giant stars, dead stars, exploding stars, binary stars; by now, you might suppose that every kind of star in the Milky Way had been seen. That’s why a recent discovery is so surprising. Researchers using the Subaru telescope in Hawaii have found a star with spiral arms. The name of the star is SAO 206462. It’s a young star more than four hundred light years from Earth in the constellation Lupus, the wolf. 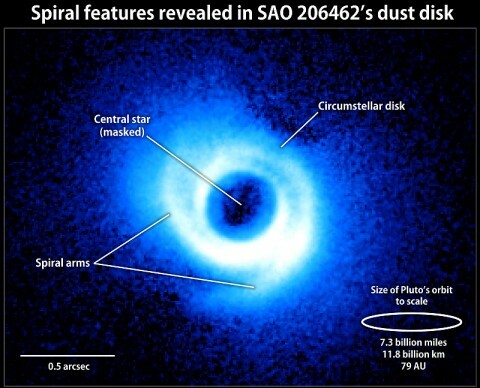 SAO 206462 attracted attention because it has a circumstellar disk–that is, a broad disk of dust and gas surrounding the star. Researchers strongly suspected that new planets might be coalescing inside the disk, which is about twice as wide as the orbit of Pluto. When they took a closer look at SAO 206462 they found not planets, but arms. Astronomers have seen spiral arms before: they’re commonly found in pinwheel galaxies where hundreds of millions of stars spiral together around a common core. Finding a clear case of spiral arms around an individual star, however, is unprecedented. Ok guys... whos got spiral flex section? star wars : last hope.